A modern day version of this Spanish soup is so delicious and perfect for a summer meal! 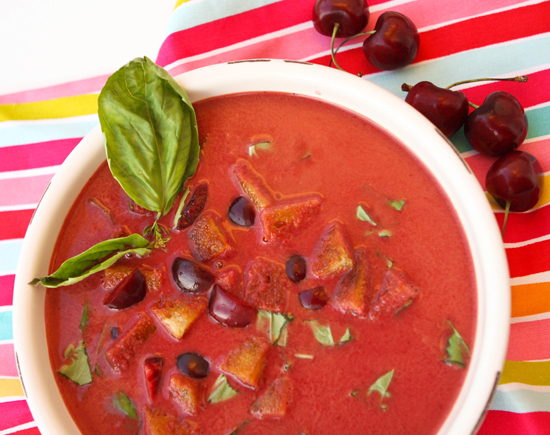 Sweet cherries, fresh vegetables and spicy flavors all blended together with some basil to create a refreshing bowl of soup that is so tasty! Bing cherries are the first things I see upon entering the grocery store. I almost always put a bag in my cart. Usually I end up snacking on them throughout the week and ultimately eating the entire bag by myself. 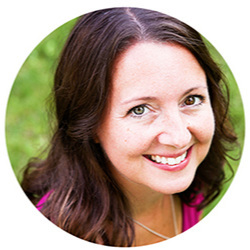 My four-year-old tells me, "Mommy, you're going to turn into a cherry! And Sammy is going to turn into a blueberry!" It's true, I can see both things happening. Sam adores his blueberries and I adore my cherries. I rarely think to cook with cherries because then I would need to buy two bags every week! One to snack on and one to cook with. I desperately wanted to make this Cherry Gazpacho. And I'm glad I did. Upon taking my first bite of this summery soup, the following words popped into my head: FRESH, cherries, cucumbers, FRESH, summer, basil, YUM. It’s a summery version of the traditional tomato-ey Spanish soup. You will need two slices of 1-inch-thick Pullman bread. Drizzle 1 slice of the bread with olive oil on both sides. In a medium skillet, fry the bread over moderate heat, turning once or twice, until golden, about 4 minutes. Rub the fried bread slice with 1 whole garlic clove. Cut the bread into 1-inch cubes and transfer to a medium bowl. Let this mixture stand at room temperature for about 2 hours. Meanwhile, remove the crust from the remaining bread slice. Cut the bread into 1/2-inch cubes and toss with 1/4 cup of olive oil. Cook over moderate heat, stirring frequently, until the croutons are browned and crisp, about 4 minutes. Transfer the croutons to paper towels to drain. Discard the garlic clove and thyme sprig and season the croutons with salt. Working in batches, puree the cherry and bell pepper mixture in a blender until completely smooth. Strain the gazpacho through a fine-mesh sieve into a medium bowl. Season the soup with salt, pepper and Tabasco. Serve right away! Then make sure to have a Sparkling White Sangria ready to go with it! How Long Does Gazpacho Last? 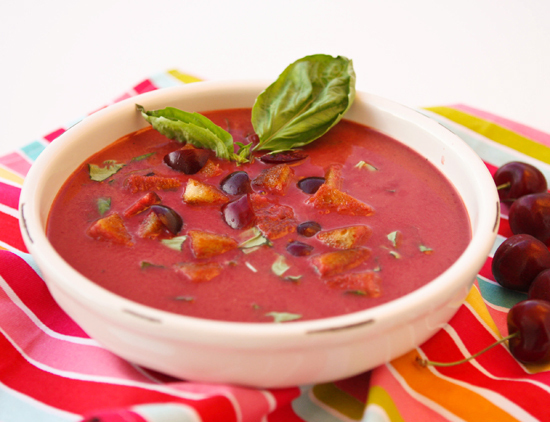 Once you’ve prepared and enjoyed your first bowl of Cherry Gazpacho with Basil Soup, you can save the remainder for another 4-5 days in a air-tight container in the refrigerator. A soup that hails from Spanish cuisine, it’s a soup that is served cold. It infuses a variety of flavors together from tomatoes, raw vegetables and spices. Gazpacho is fun to twist different flavors into the soup and this Cherry Gazpacho soup is just that - an amazing twist on adding a sweet fruit to recipe! It’s also been known to be called a “liquid salad”. Drizzle 1 slice of the bread with olive oil on both sides. In a medium skillet, fry the bread over moderate heat, turning once or twice, until golden, about 4 minutes. Rub the fried bread on one side with 1 whole garlic clove. Cut the bread into 1-inch cubes and transfer to a medium bowl. Add the sliced garlic, red and yellow bell peppers, cucumber, whole pitted cherries, tomato juice, red wine vinegar and ¼ cup of the olive oil. Season lightly with salt and pepper and let stand at room temperature for about 2 hours. Meanwhile, remove the crust from the remaining bread slice. Cut the bread into ½-inch cubes and toss with the remaining ¼ cup of olive oil. Add the bread cubes to the skillet along with the thyme sprig and the remaining whole garlic clove and cook over moderate heat, stirring frequently, until the croutons are browned and crisp, about 4 minutes. Transfer the croutons to paper towels to drain. 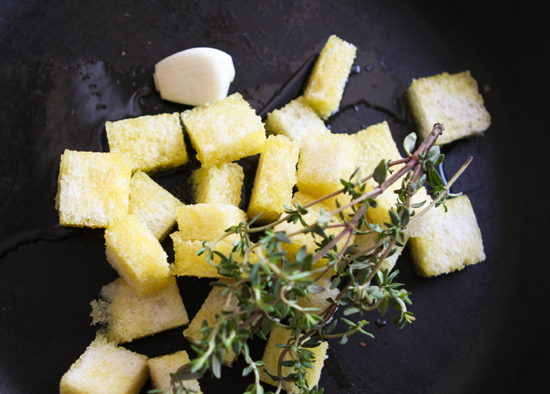 Discard the garlic clove and thyme sprig and season the croutons with salt.